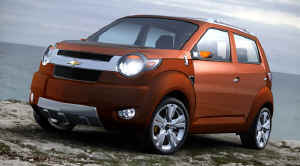 Active buyers who want to get in touch with their sportier side – or who just want to navigate the urban jungle in a sportier ride – will make tracks to the Chevrolet Trax, an urban front-wheel-drive crossover concept with a twist: This micro SUV has an electric limited-slip differential that features an independent battery pack and an electric motor to drive the rear wheels, providing a low-cost all-wheel-drive system. The four-door Trax is bathed in a Blaze Orange exterior finish, with rugged Burnt Orange accents on the front and rear corners that reinforce the notion this Chevrolet is all business despite its small size. Simple door lines make getting in and out easier; and fold-flat rear seats add functionality. Other features that suit its dynamic and off-road character include a voluminous, single-unit bumper and fender in front and rear, a pronounced front wheel arch shape, dynamic side character lines, a rear-mounted spare tire and roof rack. Brake calipers in Flame Yellow infuse additional attitude. The package rides on 16-inch wheels and Kumho tires for precise ride and handling. The Trax is powered by a 1-liter gasoline engine.